A place of dreams and dark desires. Scott Louis Photographic, Large body of male figurative fine art and reportage photography with influences derived from gothic, glam, punk, deathrock, and fetish subcultures with genderbending overtones. A personal gothic site with links to more gothic places. How to decorate your home for a Gothic evening of entertaining. Also includes several recipes. Collection of texts which deal with Gothic literature and resources concerning this topic. Gothic themed webpage toys, parodies and artist bio. A personal ad service for Goths looking for friendship or more, available to all members of the Gothic/alternative community. personal ads for friendship or romance, targeted to the gothic/alternative community. all services free. Links to gothic clothing and accessories. Information and resources for the California goth community including gothic clothes, art, architecture, and nightlife. Humorous tutorial on gothic dancing. Terms used in gothic cathedrals. Designed to be a hang out spot for goth/vamps, and others for expression without persecution. If there are any questions about the 'gothic' lifestyle the people will tell you their oppinions. Web community for people who like gothic, darkwave and industrial music, with a message board, chat room, radio listings, clothing and venue links. A personal website from a guy in Michigan telling his outlook of the world. With interests including, goth/gothic, roleplay, quotes, and poetic lyrics. Chat, free email, message board, images, links, pagan rituals, astrology, candle magick, and recipes. An in depth look at punk culture and its subcultures, starting in the 1960s. British photographer Andys gallery of gothic studio and on-site photography. Elaborate costumes and scenery. Local events, bands, and forums for the Nashville, Tennessee gothic scene. A New Orleans based Discordian Cabal. Includes the Book of Eris, numerous links to Discordianism, Chaos Magick, Tantra, and Gothic subculture. Dedicated banner traffic exchange for Gothic, punk, tattoo, piercing, alterna, fetish, and related sites. Gothic database of events, music, art, fashion and lifestyle. Based in The Devonshire Arms Gothic pub,Camden,London. Gothic and fetish fashion magazine. Current issue information, advertising rates, media and contact information, as well as links and testimonials. Jennifer Pitcock aims to dispel the myths and misconceptions surrounding the Gothic subculture, in an effort to promote tolerance and understanding. Gothic and feminist art that makes you think. Gallery is based in Toronto but shows international Neo-Gothic artists like Charles Alexander Moffat and Victoria Van Dyke. The haunting website of dark art photographer Vasily Konstantin. Contains all series, documentation projects and portrait photographs of various subcultures, followed by purchasing prints and contact options. Handpicked links to gothic art and community websites. Message board dealing with the gothic community and goings-on in Northern Nevada. Tridentine Mass set in Abbatissa Discalceata Gothic text. Kalligraphy under copyright but permission granted for any printing intended for private devotional use. Official site of the gothic model, Lady Angellyca. Photography, artwork, and links to various black metal bands including 'Forever Slave' who Lady Angelica is a member of. The website of Liluri - UK Gothic and Alternative Model. Photographic portfolio within. Online portfolio of Lilith Astaroth, gothic & fetish model, metal singer, and writer. Small gallery of images as well as information and contact details for Lilith. The official site of Gothic Model Wednesday Mourning. If the business hours of Welcome to My Domain in may vary on holidays like Valentine’s Day, Washington’s Birthday, St. Patrick’s Day, Easter, Easter eve and Mother’s day. We display standard opening hours and price ranges in our profile site. We recommend to check out members.aol.com/eebb2/ for further information. 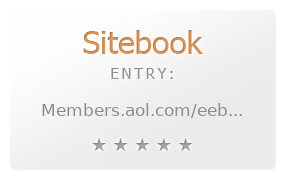 You can also search for Alternatives for members.aol.com/eebb2/ on our Review Site Sitebook.org All trademarks are the property of their respective owners. If we should delete this entry, please send us a short E-Mail.